I found this online at a scrapbooking site when I was looking for something else. Although it wasn't on sale, it still seemed like a good deal because of its potential, so I ordered it. 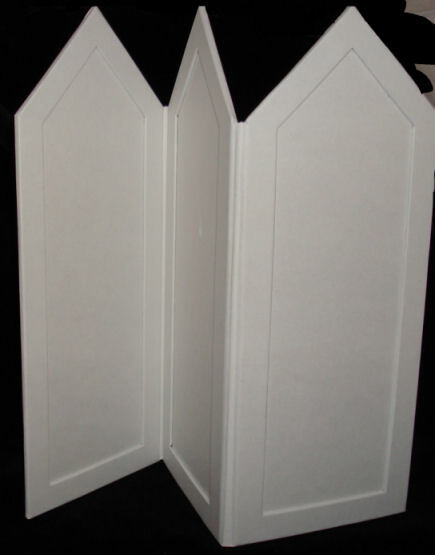 I can see this folding screen used as is, but it also has lots of possibilities for decorating. I can see it standing inside a dome to provide lots of display space in some kind of shop. Add some hooks and hangers and it could work as clothing displays, or add shelves. 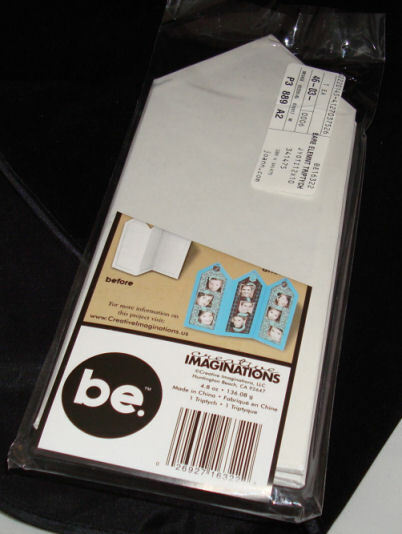 This brand has lots of plain white items that have lots of possibilities for miniaturists. 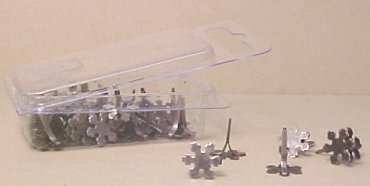 These metallic snowflake brads were greatly reduced by mid-February. At this point, I don't have specific uses in mind; maybe as bases for a Christmas candle; or as part of bookends; trim on furniture or shelving in my Christmas shop ...? Cut into sections, they could be some kind of little critter feet. I have a feeling they could be useful in quarter scale for something, too. 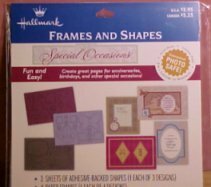 I purchased this package of Hallmark frames and mats to use for scrapbooking. However, when I opened it I was struck by the fact that one of the mats looked exactly the same size as the backing for a little one-inch shadowbox I had recently used as a setting for a Grandchildrens Project (see Joseph's Sleigh Scene, Projects for Children). Since I had another of the little shadowboxes, I decided to try it. Our time is all today. 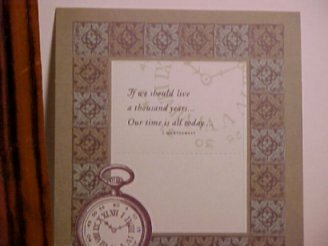 The thin paper mat is designed so that the center section pops out in order to insert a picture or two on a scrapbook page. I think I will glue the mat to a sturdier piece of cardboard and use it flat against the glass as an inner frame, with the popped-out lines as part of the background. 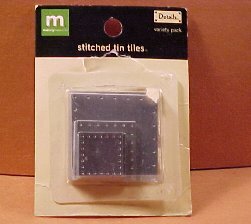 I saw these little metal squares among the scrapbooking materials at Michaels and immediately thought, tin-topped table! When I opened the package, I discovered a surprising number of these little squares inside. Enough to do kitchen worktables in both twelfth and quarter scale, as well as perhaps some cabinet door inserts, and who knows what else? By the way, the largest tin here exactly fits a square woodsie. I haven't yet tried to see if I already have wood shapes that the others will fit. I thought at first these plastic domed ovals were intended to go between glass shelves or tabletops and their bases. They were with other scrapbook items, however. 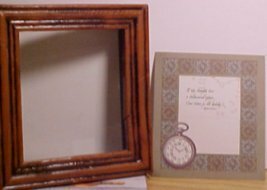 My thought was that, with the appropriate frames, they would make good domed picture glass for old-fashioned pictures. I have two full-size antique scenic pictures in our guest room that have curved glass fronts like this. You know those return address labels that we get in the mail from various organizations? Well, my husband does not like to have little pictures on his labels, so I cut these birds off, figuring I could use them eventually. 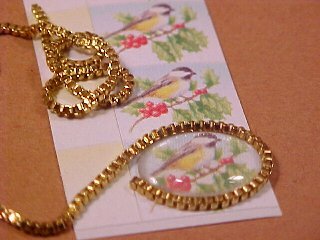 Here is one of the plastic ovals and a piece of gold chain that could be cut to form a frame. These would also make nice little table gifts, perhaps. 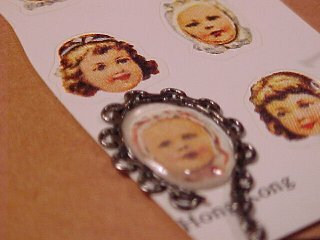 Here the little oval is used to cover a tiny old-fashioned child picture sticker. The pewter links that could also form a frame were from an old necklace. 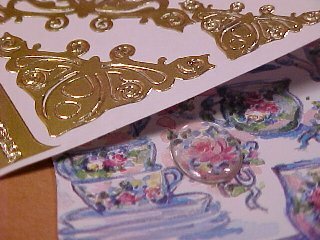 Here are some gold stickers and some roses tea cup and teapot-themed stickers. Notice the oval over one of the small blooms. 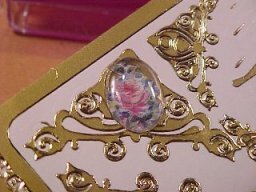 Here the oval rose picture is placed atop the gold sticker. I can see this as a trim on a fancy cabinet, perhaps a headboard, etc. The other sticker elements could be used as additional trim for a really ornate look. Obviously, Scrapbooking aisles are treasure troves for miniaturists. We can hardly pass a display without seeing dozens of items we can use, right?